TORONTO - While many homeowners have big dreams of beautifying their spaces, handyman Mike Holmes wants them to also think of the less glamorous side of property upkeep: regular home inspections and maintenance. "You will save a fortune in money if you do this, because if you go ahead and renovate that kitchen before you take a look at the roof and it leaks, that's going to cost you a big amount of dough," said the straight-talking contractor and home improvement host. The "Holmes Makes It Right" star said he has fielded countless questions over the years on home maintenance, from queries about roofs to sweating windows. With his new book, "The Holmes Manual" (HarperCollins), due out on June 3, Holmes offers guidance on how to spot potential signs of property damage while also sharing tips in response to common repair questions. "We look at our cars. We constantly check our tires, right? ... And we pay more attention to our vehicles than the single most expensive investment of our lives — your home," Holmes said in a recent phone interview. "Yes, you need to pay attention. You need to check your filter on your furnace every single month because if your filter's dirty, then you're actually smothering your furnace. You can burn out your motor because it can't breathe properly anymore. It's not moving air the way it's supposed to." While icicles dangling from the edge of a roof may seem picturesque, their appearance is typically the sign of several different problems, said Holmes. Among them: heat loss from the house heading into the attic space. "When we have heat loss in the attic, we have hot meeting cold. That can actually mould the entire inside of your attic." 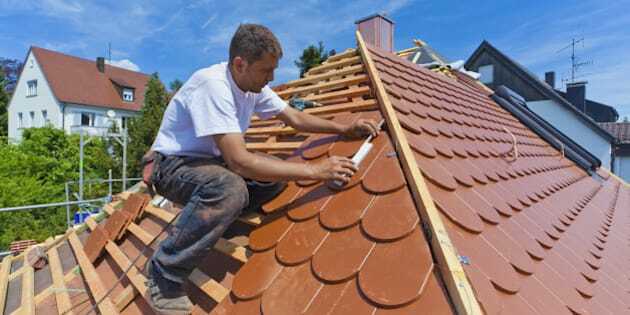 Holmes writes that shingles that are curling or buckling at the edges are also red flags. It may be a sign of natural wear and tear. But Holmes adds that exposed bare patches on asphalt shingles — which gradually lose granules over time — or large amounts of granules in gutters may be signs of poor ventilation in the attic where rising heat tends to accumulate. "If that heat gets trapped because you don't have a well-ventilated attic, it can warm up the roof, causing asphalt shingles to stiffen up and age more quickly," he writes, noting that the ventilation issues can also cause ice dams to surface. Holmes said while it's important for homeowners to be educated and knowledgeable about possible problems, that doesn't necessarily mean they should take the reins to repair them — particularly when they may be lacking key skills. "You shouldn't do the roof unless you know what you're doing — and I mean really know what you're doing," he stressed. "You shouldn't play with electrical. You shouldn't play with your HVAC (heating, ventilation and air conditioning) and you shouldn't play with your plumbing. "I think the majority of the people are trying to learn what they need to learn about their house (and) who they should be calling to fix it," he added. For reno-minded homeowners, the book offers detailed comparative charts for items, including roofing vents, sidings and finishes for fences and decks, as well as step-by-step project instructions, like finishing a basement floor. But preventive maintenance remains top of mind for the handyman. And with spring now in full swing, Holmes said the season is prime time for making inspections to ensure that water isn't seeping into the home. "You've got to look at your eavestroughs — clean them out. Your downspouts — make sure they're not blocked. .... Look at all the caulking around your doors and windows," he said. "If you can't get up on your roof ... get a pair of binoculars and take a really good look around the chimney, make sure that none of the weather has ruined your roof system. "The more you take a look now, the absolute better. Don't just concentrate on flowers and cleaning up the garden."